The Horse Conch is a one bedroom one bathroom suite in a house consisting of three vacation suites. Decorated with tropical color palette and has a queen bed. 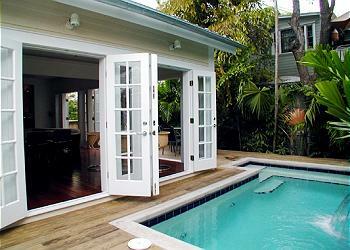 Accessed from the second floor covered porch that overlooks the shared gardens and pool below. Rooster Conch is a one bedroom one bathroom suite in a house consisting of three vacation suites. Decorated with tropical color palette and has a queen bed. Accessed from the second floor covered porch that overlooks the shared gardens and pool below. 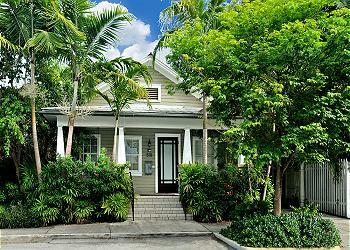 28 Day Minimum rental: This restoration of a majestic Key West bungalow is simply incredible. Modernists will love this property. This two bedroom, two bath home has just been completely renovated. 28 Day Minimum rental: Situated in the heart of Old Town Key West, on the legendary Caroline Street, this beautifully restored historic property sits nestled amidst serene tropical foliage. Open the door to Villa Serena and find yourself transported to a peaceful sanctuary. Recently renovated in February 2018, Villa Serena is the perfect space for your relaxing vacation. Cayo Hueso Cottage is found on a quiet street in the Heart of Old Town. Set amid plumerias and palm trees, the property is conveniently located near favorite restaurants like Mangia Mangia, Michael's, Azur, 5 Brothers and Date & Thyme. This 2 bedroom, 2.5 bath rooftop town home is located within the quaint community of Duval Square. Beautifully decorated with bright colors and unique art work, this property will give you a great Key West experience and is perfectly located right in the heart of old town Key West. From the owners of South of Frances, here is another beautiful, historic restoration project. This lovingly restored home is ready for guests following a complete redo! The attention to detail and master craftsmanship can be seen everywhere in this beautiful home. Location! Style! Elegance! This beautiful home is the fabulous combination of everything a great vacation property should be. 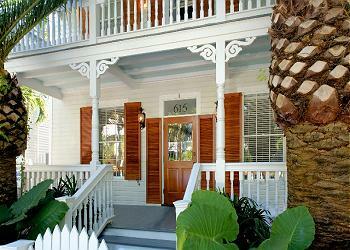 One half block to Duval Street in the historic district, the location can't be beat. Located just steps from famous Duval street, this two-story town home is located in quaint, cobble stoned Duval Square. You are within the heart of the historic district and can walk almost everywhere. Although close to Duval, the home is a quiet escape from the hustle bustle.